Like many successful fundraisers it all starts with an idea. 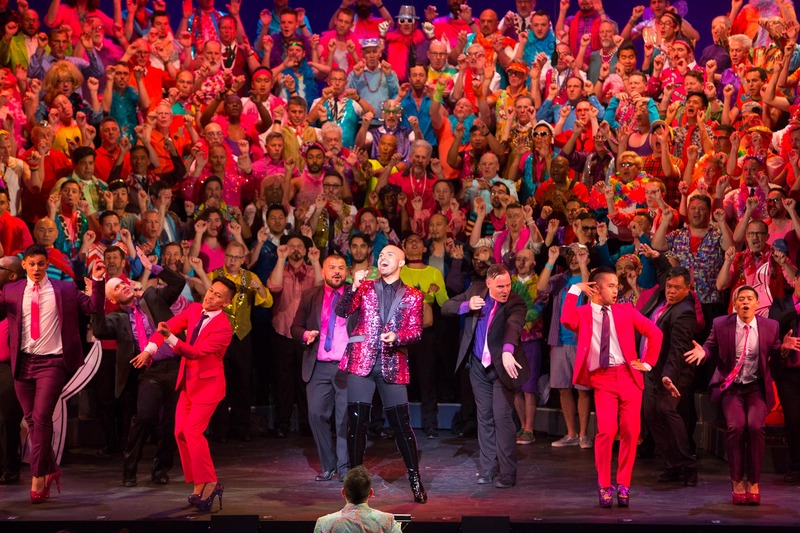 An idea that Jonathan Weedman, Executive Director of the Gay Men's Chorus of Los Angeles, had back in the summer of 2017. The idea: using proven peer-to-peer fundraising techniques from other nonprofit organizations and implement the same model for a chorus of 300 singers. 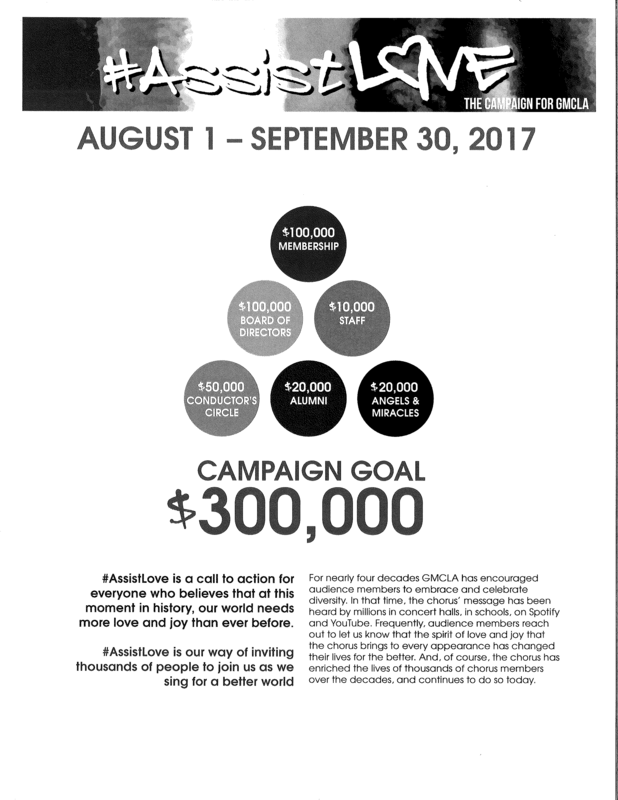 By the end of the summer, GMCLA's peer-to-peer fundraising campaign had yielded $80,000 in donations. So how did they do it? Jonathan shares their story. Whether you know it or not, you've all seen the peer-to-peer fundraising model in action. Nonprofit events such as 5Ks, bike-a-thons, and walk-a-thons often have fundraising requirements involved for their participants. (Surely you've all received donation requests from your friends involved in these activities!) 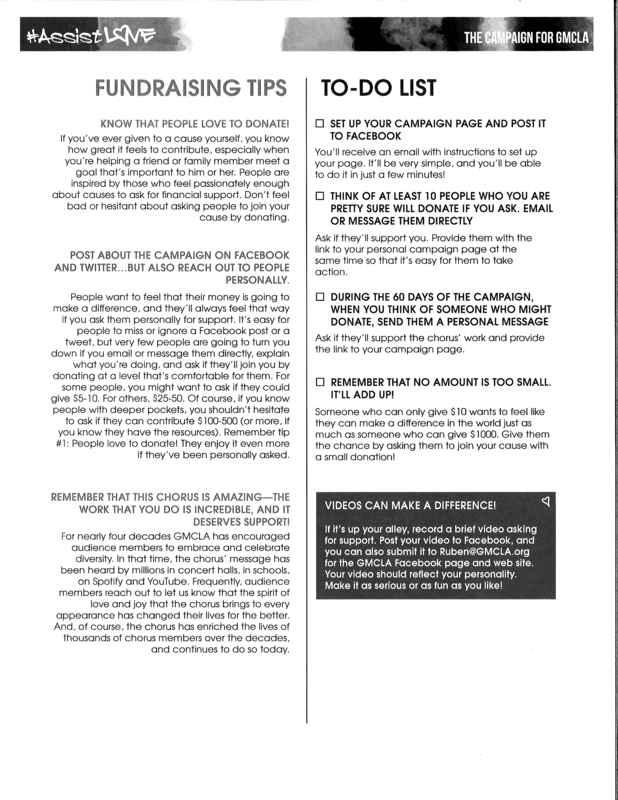 The method behind the madness is motivating participants to directly solicit donations from their personal social networks. For Jonathan, he drew on inspiration from California's AIDS/LifeCycle. "They have 2,500 people riding bikes down California from San Francisco to Los Angeles. Everyone can participate if you ride a bike," Jonathan says. "The minimum amount that each rider has to raise in order just to participate is $2,500! And the average amount each rider raises is $6,000." "When you start to do the math," he says, "you can see how this could be a hugely successful fundraising model for choruses." And so, he brought the idea to GMCLA. "I thought I had a great model," Jonathan says. "Just get the singers to go out and ask for money!" He laughs, "But it proved to be more challenging than I thought." His main challenge: convincing the singers to participate. "We ask a lot of the guys: to sing concerts, participate in outreach activities, attend rehearsals, do dance auditions, sell tickets, and now we're asking them to raise money from their networks." Some singers simply felt overwhelmed by the idea and didn't feel that they could give more to the organization. Jonathan worked to educate and motivate the singers while also making it as easy as possible for them to be successful fundraisers. It's no surprise to Board Members, Chorus Managers, and Executive Directors that it takes a lot of money to produce a season. But often times members are not privy to the same financial information and lack the understanding of what it takes to run a nonprofit organization. Simply put, they need to be educated in the chorus's finances. Jonathan started there. He explained the chorus's financial situation - how much money comes in and goes out, how much money is needed to operate a chorus, and where the money is allocated. This helped provide some context into why he was requesting help from singers. The next step was to provide incentives to help motivate the singers. "Like any fundraising campaign, sometimes you've got to spend money to make money," says Jonathan. "If the guys achieved certain fundraising goals, we would reward them. We had a whole tiered system of prizes." Jonathan emphasizes that there was some initial disagreement when considering introducing prizes and incentives into the mix. It is important that choruses carefully consider what type of incentive plan works best for their organization and that their leadership is on board with the plan. 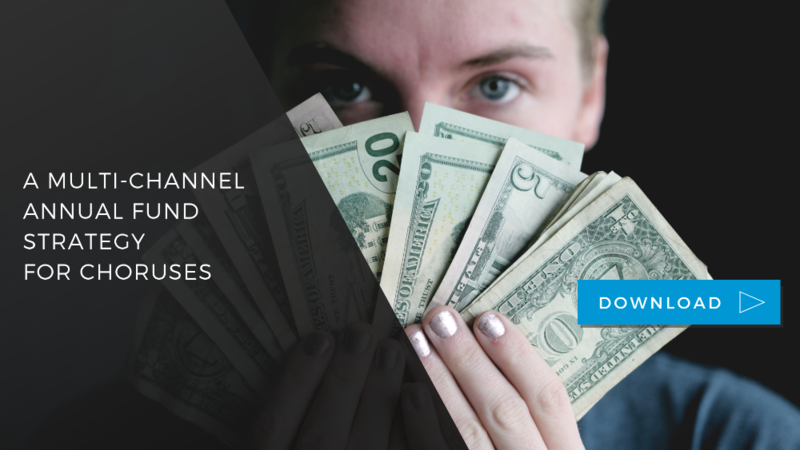 It's not uncommon for nonprofits to use incentives as a way of motivating their fundraisers but it is important to analyze the expense-to-income ratio for the campaign and decide on amounts that your organization is comfortable with. 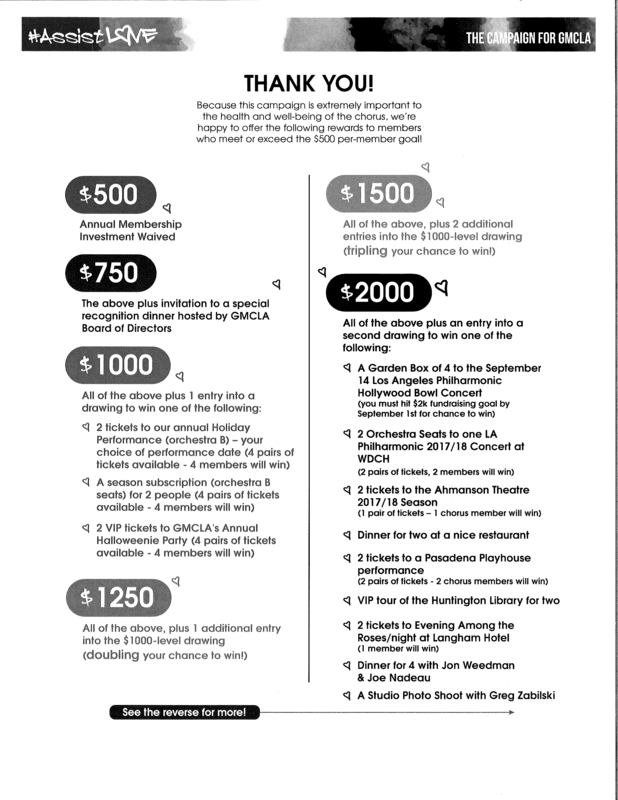 While educating and incentivizing the chorus did help motivate the singers, GMCLA still had only a 5.5% participation rate in the chorus for their first go at this fundraising campaign. As it turns out, even 5.5% of the organization could make a huge impact when given the right tools to succeed. Jonathan knew that he would need to provide an easy way for members to solicit funding from their networks. So, he hired a company to set up individual fundraising websites for each chorus member. 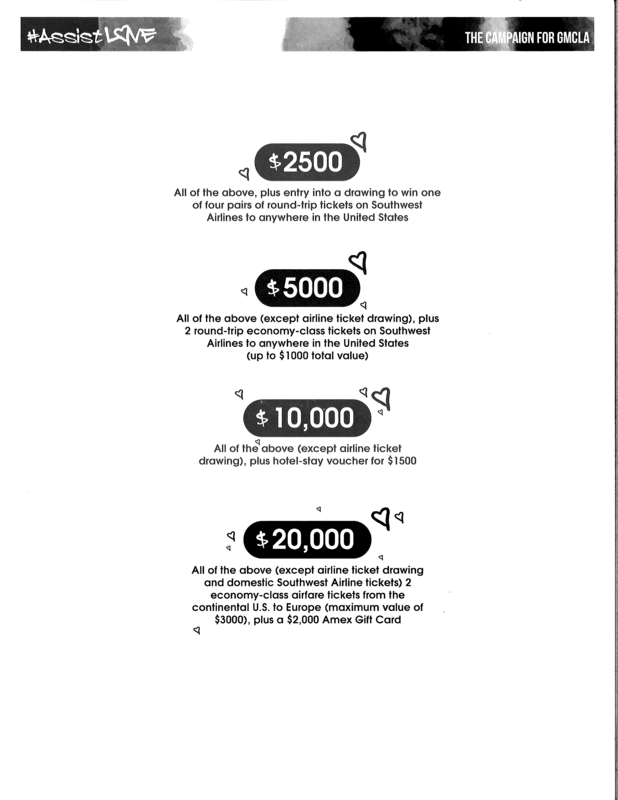 The members would then send their fundraising page link to their friends and family via email and social media. Jonathan then helped singers conceptualize "the ask." He would tell the singers, "Think of the people you interact with every day - your hairdresser, lawyer, accountant, thousands of friends on Facebook, coworkers, your entire network of people who know you." And then, (here's the crazy part) just ask! "Most people are willing to give you something if you make a direct ask," Jonathan continues. He even created a list of tips and instructions for the participating singers (shown below). 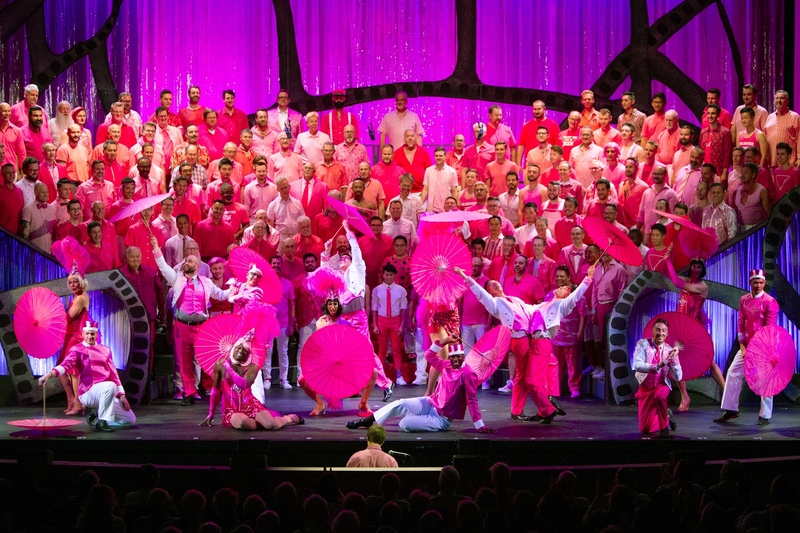 In addition to the singers' efforts, GMCLA launched their own marketing campaign to help generate buzz. They hired someone to create posters and hang them around town, created and boosted posts on social media, and sent emails to their donor and email subscriber database. The fundraising campaign in its entirety lasted about a month. Throughout the process, Jonathan kept singers and subscribers in the loop with updates on their fundraising progress. In the end, most members were able to raise between $100-$1,000 with a few members going above and beyond raising several thousand dollars. "Our peer-to-peer fundraising campaign for a first go-around was a success with almost $80,000 raised," Jonathan says. "After expenses, our net take-home was $60,000." Most choruses can only dream of a fundraising event that brings in $60K, so I say those are some pretty incredible results! 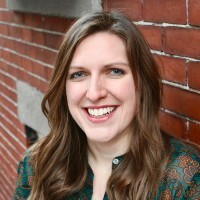 Jonathan encourages other choruses to adopt this model, "For choral organizations, there is incredible opportunity for this model due to the sheer number of members in the organization and the network that each of those members can bring. Everyone in the movement needs to do this. Commit to it. Your singers must be on board (that is key). And it will transform your organization." Thank you to Jonathan Weedman and GMCLA for sharing their story! To learn more about GMCLA, visit their website, follow them on Twitter/Instagram, and like them on Facebook.